The drive south to intersect with the H1-6 is a long distance in Kruger Park terms via the splendid look-out point Shibavantsengele, Grootvlei Dam and the new Sasol sponsored Nyawutsi bird hide. The drive is somewhat dull in comparison with the riverine drive left behind. On the other hand I can only say that for the day I travelled it and in the Kruger National Park nothing remains the same for long. Despite this comment there are some wonderful look out points and a couple of extra special watering places ... the Grootvlei (Hlamvu) Dam on the Hlamvu Creek and Nyawasu. Waypoint 110 ... The Sasol sponsored Nyawutsi ( meaning in Tsonga "a lion with a long mane") bird hide. When I first approached this location for a bird hide I asked why would a hide be placed here? In fact there is a permanent water hole at this spot on the Ntshivana Creek ("a small mane"). It is also the point where the Northern Plains come close to the Eastern Mountains. This means the hide is an area where the potential to see birds of numerous different habitats can be found ... riverine, wetland, plains, mountains and of course close to a large dam and river system. Here are some of the bird hides built to date in the Kruger ... there are generally no public conveniences at these points. It is possible to stay overnight (with special arrangements) at Sable bird hide close to Phalaborwa and (I think but can't remember) Shipandane. Waypoint 111 ... Saw 3 Ground Hornbills here. There is a special project on the go at the moments designed to gather as much information as possible on this large fascinating bird that spends most of its time proudly walking the grassy areas looking for anything edible. I remember seeing one carry a small snake around for quite some time before eating it. Waypoint 112 ... I stopped to admire Kostini Hill bedecked with beautiful trees in evergreen and autumn foliage colours. It reaches a height of 342 metres. The hillside was marked with white paint ... I wonder why? At one stage if not now it was used as an outpost. Waypoint 113 ... The creek Hlamvu (means bullet) is dammed to form the Grootvlei Dam (better known as Hlamvu Dam ... the Afrikaans Grootvlei name which means "big marsh" was so given at the time the dam was built in 1984) in the valley of the same name as the creek. This dam is the point marked by 113 and is a short drive off the S50. 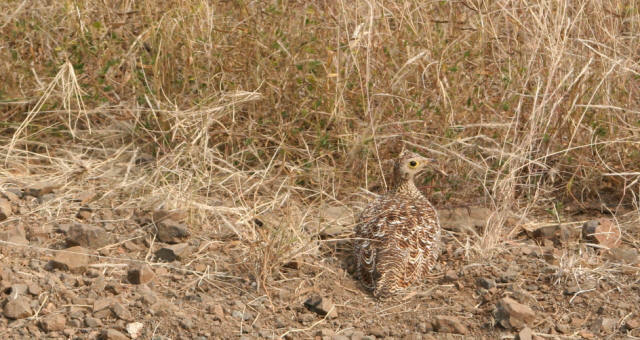 Close by I saw a Double-banded Sandgrouse but only just ... note how well camouflaged this bird is in the image shown. It stays completely motionless hoping to avoid detection. However it is obvious from watching it at close quarters it is ready for an immediate launch if necessary. Waypoint 114 about 30 kms from Shingwedzi camp ... view of the magnificent hills in the Lebombo range of mountains called Kumba (440 metres high) named after a stream of the same name and Manghoto (420 metres high) rising in the east (the the left of the road as I drove south). Waypoint 115 ... I turned off the road and drove up to the lookout point just north of the hill called after a wild sour plum ... Shibanavtsengele (480 metres). The lookout provides a view far to the west towards Mooiplaas and overlooks vast plains dotted with Mopane scrub. This is one of the best places to see how the plains roll out. This drive section is quite long and not very inspiring compared to the riverine areas around Shingwedzi. Waypoint 116 ... marked a sudden change in grass colour. The grass suddenly became very green on one side while on the other side the bush was very bare with hardly any grass. Traffic was virtually non-existent. There was the normal sign of an elephant, followed by the certain signs of a large buffalo herd. The buffalo droppings extended about 100 metres from the start until the droppings stopped. The buffalo had crossed the road not much earlier and it was obviously a large herd as shown by the width of the dung patch. Because they are so difficult to see once in the Mopane scrub they could be only just metres away from the road. Waypoint 117 ... a significant change in scenery. On the one side thorn trees and the other wide open Mopane-dotted flat land that would probably be perfect habitat for Cheetah but I had hardly seen any prey animals on which the Cheetah might feed. Shortly after this at waypoint 118 I came across a Baobab tree .. first I'd seen for quite a while. How did it get here ... all alone? The answer probably lies in in the way elephants feed. They eat the Baobab fruit with seeds and walk long distances dropping undigested organic matter along the way. In the right circumstances these seeds then germinate. Waypoint 119 ... marks the turn off to the "Tropic of Capricorn" loop S143. About 16 kms long but this drive would be done later. I continued along the S50 and saw signs of elephants before meeting large flocks of Wattled Starlings with their defining whitish rumps in flight. I'd come across these starlings again in vast numbers just up the road at a watering hole. A lone male ostrich now called Common Ostrich in beautiful condition appeared on the right in longish grass surrounded by shrubs. It was sitting down and whatever was happening was causing clouds of sand to appear intermittently. 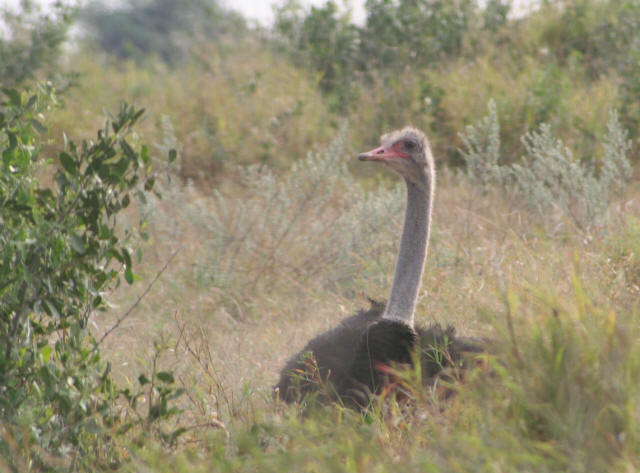 Male ostriches act as brood parent to hatch eggs. I wondered if this is what was happening. Until fairly recent times Ostriches were certainly not common and they only existed in South Africa and Namibia (previously South West Africa) and Ostrich farming was a jealously protected and lucrative industry mainly for leather and feathers (for those fine hats). Somehow the stranglehold on this industry was lost and today farming Ostriches is big business and meat is consumed for its low cholesterol content. My wife loves it ... I've never tried it and don't want to. It is a very dark red meat with no signs of fat at all. 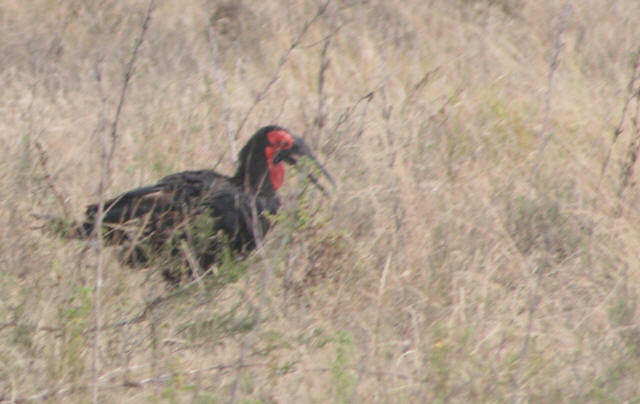 The bird is not often seen in the the Kruger Park. Other birds seen were massive flocks of Wattled Starlings and a pair of Hottentot Teals cruising on the dam. 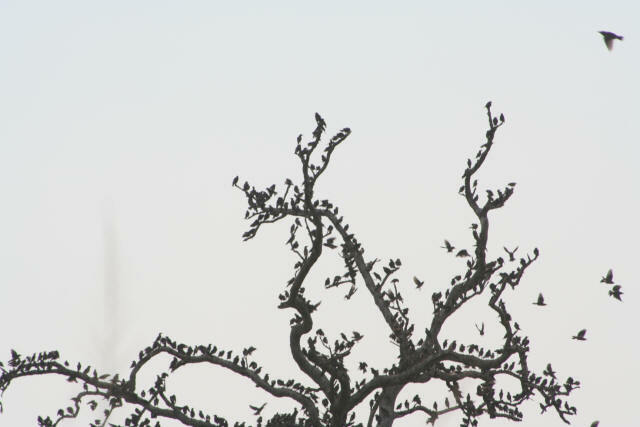 The starlings would fly down from the branches of a dead tree then fly back to perch. The tree was absolutely covered in starlings as you can see from the photo. Waypoint 121 ... turn off to S143 which leads to the main Shingwedzi Mopani road. and waypoint 122 a bit later marked the turn off to the S49 loop road to the main road. Take a look at the map above to get your bearings straight. 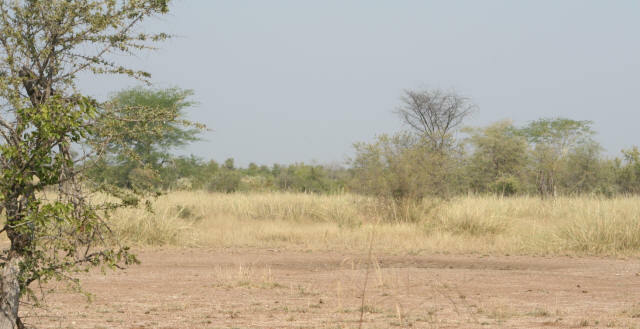 Waypoint 123 on the S49 marks a series of 14 experimental fire plots used to test the long term impact of fire at different intervals and intensity on the Mopane scrub. Each plot was of a controlled size and the experiments had been going on for quite some years already (1957). There is a detailed notice board that provides interesting results and observations from the research. 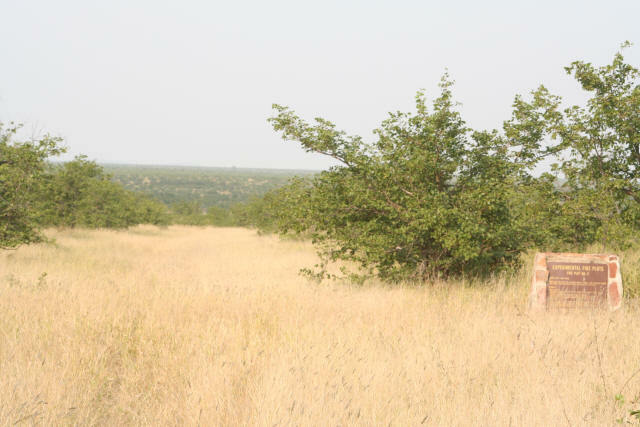 Waypoint 123 on the S49 marks a series of 14 experimental fire plots used to test the long term impact of fire at different intervals and intensity on the Mopane scrub. Each plot was of a controlled size and the experiments had been going on for quite some years already (1957). There is a detailed notice board that provides interesting results and observations from the research. Waypoint 124 and 125 ... Fire extension plot number 8 separated by wide grass corridors (to spot from the air I suppose). 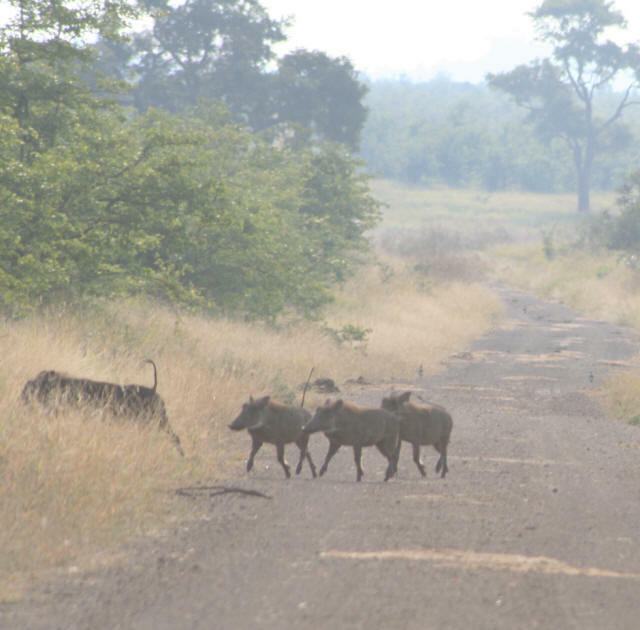 Saw a couple of very black warthogs and I would soon find out why they were so black. Waypoint 126 ... This was the spot where the Mooiplaas section of the loop road (S143) connected and also the position of a very black muddy water hole. This is where the warthogs just mentioned had come from no doubt. 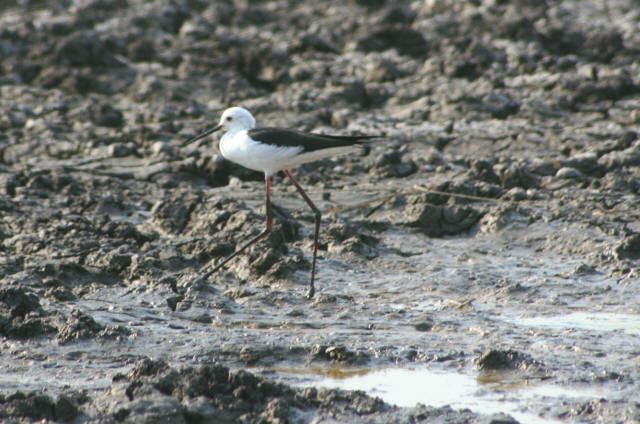 Walking with its extremely long legs and so aptly named was a magnificent Black-winged Stilt ... take a look at its striking pose and long beak for probing those muddy depths. How it remained so startlingly white in such a black environment is anybody's guess. After a short 3 kms drive I reached the main road H1-6 and I headed to the nearby Mopani rest camp for a cold drink.